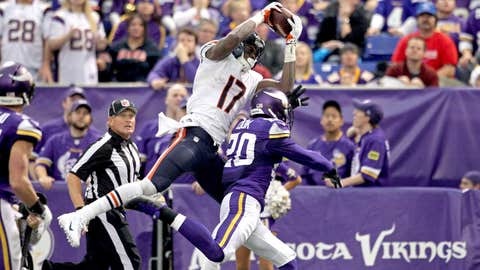 Alshon Jeffery had himself some game in Minnesota, including what could be the catch of the year. 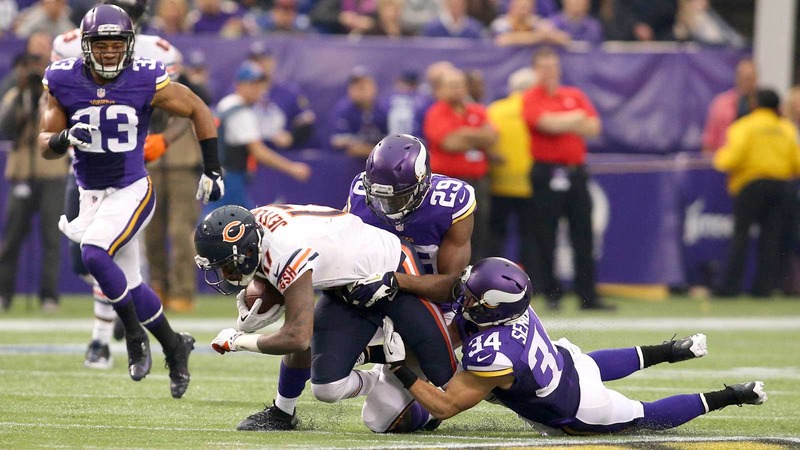 The Chicago wide receiver had more than 230 yards receiving and two touchdowns through three quarters against the Vikings and finished with 249 yards. But the catch I’m talking about didn’t come without some controversy. Here was the situation: Chicago had the ball, third-and-14 at the Minnesota 46-yard line with 5:25 left in the third quarter. Chicago led 13-10. Bears quarterback Josh McCown threw a long pass, which Jeffery made an acrobatic catch on at the 2-yard line and fell into the end zone for a touchdown with Minnesota defender Chris Cook draped all over him. It was an incredible catch and great call by side judge Laird Hayes. Jeffery got control of the ball at the 2-yard line, came down with his left foot in bounds, then his right foot to complete the second part of the catch. Then in going to the ground, he maintained control of the ball, even as Cook tried to pry it out of his hands. Then fireworks. Cook thought the pass should have been called incomplete and ended up shoving the official in the chest and was ejected. It wasn’t an automatic ejection, it’s up to the discretion of the official to make that decision. Hayes ejected him and that stood up. But make no mistake, this was an intentional shove by Cook. I’ve seen two already Sunday that baffle me — this one took place in the Chicago-Minnesota game. Here was the situation: Arizona had the ball, first-and-10 at the Philadelphia 39-yard line with 9:31 left in the first quarter. Philadelphia led 7-0. 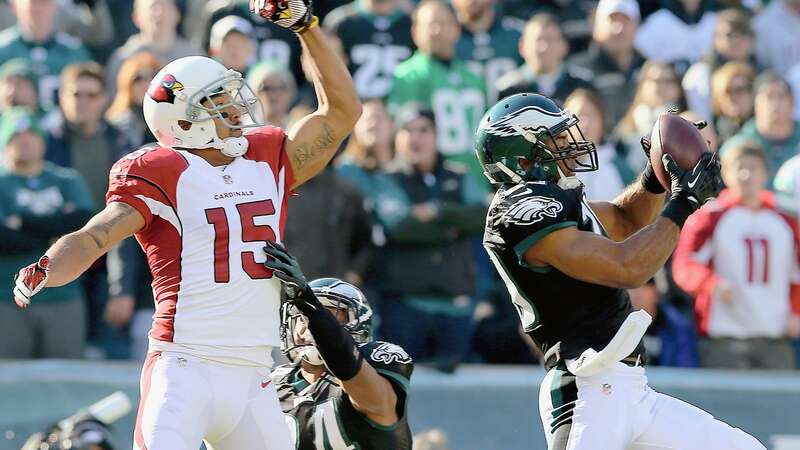 Arizona quarterback Carson Palmer attempted a pass that was intended for Michael Floyd that was intercepted by Nate Allen. Allen went to the ground after making the interception and then got up and returned the ball 43 yards to the Philadelphia 48-yard line. This is the type of mistake that can’t happen. The replay official had to stop this play and take a look at it. The rule is, that if the defender controls the ball and then is touched after getting control, he is down by contact after going to the ground. That was the case here. This was a 45-yard mistake that replay should have been involved in. I can understand why it wasn’t called on the field, but in fact, that’s why there is replay and the replay official had to do his job and clearly didn’t here.